There goes Honey Boo Boo! TLC has officially cancelled the hick-ish reality show Here Comes Honey Boo Boo, which follows child pageant queen, Alana “Honey Boo Boo” Thompson and her redneck family. The cancellation came after TMZ uncovered photos of Alana’s mother, June Shannon, in bed recently with a convicted child molester. The man in the photos is June’s ex-boyfriend, Mark McDaniel, whom was recently released from prison after serving 10 years for molesting an 8-year-old relative of June’s. While the ratings for the show have dropped recently, it was still a popular show. TLC is taking a big hit by cancelling the show, especially considering they have already taped this season and will be taking a loss on all of those of episodes that will never run. June maintains there is no relationship. After posting a statement to her Facebook page last night claiming she left Mark 10 years ago, June then posted a creepy, dark video to her fan page. In the video, June says she would never endanger her children’s welfare. 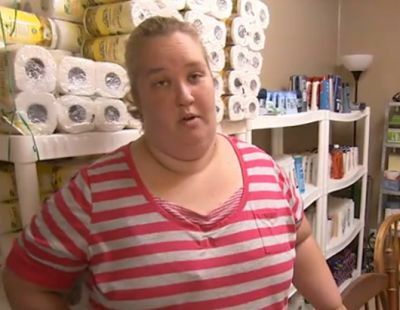 However, on Friday, TMZ dropped another bombshell on Mama June. In a story posted in the afternoon, the site claimed that June’s daughter, Anna (aka “Chickadee”), had come forward and revealed that she was the eight-year-old girl that Mark was put in jail for molesting! TMZ claims that June’s daughter Anna has come forward as the abuse victim. “Anna Cardwell — who is now 20 and married with a child — believed her mom earlier today that she was not dating the man who molested her,” the site reported. “But we’re told Anna has now received a lot more info, and is now convinced June betrayed her by seeing McDaniel again. Apparently, Anna has come forward as the victim because she is so angry at her mother for dating her alleged molester. “We’re told Anna feels her relationship with her mom has been destroyed, and the only way June can see her granddaughter is if McDaniel is nowhere to be seen,” TMZ reported, adding that TLC has offered Anna counseling. When the news of June’s relationship with Mark broke, one of June’s other daughters, Lauryn (aka “Pumpkin”), told Radar Online the story isn’t true and that the photos posted by TMZ must have been photo-shopped. Lauryn has not commented since the news about Anna broke. Let’s hope the Thompson/Shannon clan goes back to mud wrestling, burping, eating Cheeto puffs and farting as a family and keeps away from this convicted child molester! I would not let this inbred pig anywhere near my child whether the pedo creep was around or not. I would be done with her forever. I cant believe June would do that??! WTF!!? Thought the show was pretty redneck crazy…but this is disgusting! How in world could june touch a man who has touched children, let alone her Own daughter!!!! Shes ruining her and her daughters reputations! I have always love the way sugar bear loved her ! So cute! I dont think that rumor about him was true..june was obviously lookin for a way out!!! Its Gross! Dating a man who molested your child.. That’s the most disgusting thing I’ve ever heard.. Isn’t Alana around 8 years old now? Hopefully the same thing doesn’t happen to her!